This week's meals are perfect for either lunch or a quick weeknight dinner, and each option is just as good for a quick bite the next day. This week's meals are perfect for either lunch or a quick weeknight dinner, and each option is just as good for a quick bite the next day. Instead of loading your grocery cart with processed snacks, try something a little different—like baked tofu. I suggest you double the recipe and keep the leftovers in the fridge for an easy, protein-rich treat. Once you persuade your kids to try it, they'll love the bold flavor. Another great trick for having dinner ready in a flash? Chop your veggies on Sunday so you can cut down on weeknight recipe prep work. Plus, sliced cucumbers and carrots kept in cold water in the fridge are perfect at any time of the day and make preparing sandwiches and salads a cinch. An easy lunch on the go, this dish is perfect for lunch boxes, since it doesn't need to be refrigerated. 1. Preheat the oven to 400°. In a small bowl, mix together the sesame oil, tamari, rice vinegar, garlic powder, sea salt, and cayenne. Dip each piece of tofu into the mixture and then lay on a prepared cookie sheet. Bake the tofu slices for 40 minutes, flipping each slice over after 20 minutes. Remove from oven and let cool. 2. Slice open pita pockets. Smear about 2 tbsp hummus into each pocket and stuff in 2–4 slices of tofu followed by cucumber slices, carrot ribbons, tomato slices and sprouts. 3. Serve alongside apple slices or (my favorite) blue corn tortilla chips. Boneless, skinless canned salmon should be a pantry staple for anyone on the go. It's a great alternative to canned tuna. It's packed with heart-healthy omega-3s, and I like to pair it with avocado for even more healthy fats. 1. In a mixing bowl, combine the salmon, mayonnaise, mustard, and curry powder, adding a little more mayonnaise if the mixture seems too dry. 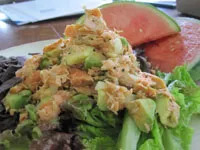 On each plate, divide up the lettuce and top with a scoop of the salmon salad and a few cubes of avocado. 2. Serve alongside fresh fruit, such as grapes or watermelon. One of my favorite meals to throw together at the very last second. It takes only 20 minutes, start to finish! 1. Bring the liquid to a boil on medium-high heat. Add the quinoa and salt and reduce heat to simmer. Let cook for about 13 minutes or until the quinoa has soaked up all the liquid. Fluff with a fork and remove from heat. 2. Cook the shrimp in a nonstick skillet over medium-high heat. Add to quinoa and stir in sauce. 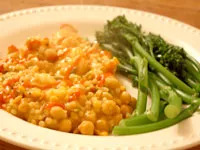 Serve alongside a green vegetable such as broccoli or broccolini to round out the meal. A quick and easy classic! I like to keep frozen chicken breasts in my freezer so I can throw this together fast. 2. Combine the flour and spices in a plastic bag and shake well. Add the chicken breast and shake. 3. Heat up the oil in a skillet (I use a cast iron). When it’s spitting hot, add the chicken breast and cook for about 3 minutes per side until just done (even a little underdone). Remove and set on paper towels. 4. Add the chicken broth/liquid and the lemon juice to de-glaze the pan. Cook for about a minute, then add the chicken back in and cook until the chicken is done and the sauce has thickened up a bit. 5. Serve topped with minced parsley.